This page lists the breeding stock that we have for sale. Check back, as we update this page with descriptions and photos of sheep as they become available. Ewe Lamb prices vary, call for current prices. 'Grade' Dorset and registerable Dorset ewe lambs available. 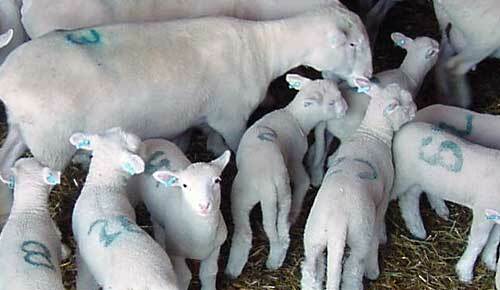 Fall and winter born ewe lambs are usually higher priced than the spring ewe lambs. Terms of sale: All prices are per head picked up at the farm. Health papers, Registration/Transfer Fees, Delivery Charges, and any special requested vet work or blood tests are all at the buyer’s expense. All sheep are guaranteed healthy at time of shipment. All sheep are guaranteed fertile if fed and cared for properly.